Like Betamax in the 1980s and VHS in the 1990s, DVDs are now becoming obsolete and being replaced by higher quality, more versatile media. Because of this, all of our transfers included a “Master Image Sequence” for you to draw from in the future as the way we look at our movies changes. To learn more click here. The transfer system that we are using to convert your film to digital video was designed for the Academy of Motion Picture Film in Hollywood to create high quality reliable, accessible digital files of their film archive. These units are a true frame by frame scanner using a high bit sensor to capture image. This means more accurate color, no vignetting, no color fringe on the edges of the frame, and less loss of detail in the shadows and highlights on contrasty scenes. There are no sprockets or claw on the units so they are very gentle on your film. The scan resolution of an 8mm frame is not less than 8000 dpi – significantly more than adequate to capture all of the useful detail in your film. We are very pleased with our new movie film scanners – we’re confident you will be too. Please Note: We will require a hard drive to put your archive copy on because the files are very large. We will advise you on what size of drive you will need to provide. Please make sure you send us a large enough drive! Alternately, we can supply an appropriate new drive for you. You do have the option of not taking the archive version of your film but in good conscience, we can’t advise it. There will be a 50% surcharge on 9.5 mm film transfers due to extra handling issues. 9.5 mm film is normally very old and can be fragile, with deteriorating glue splices that often come apart during scanning. Added to this is the fact that 9.5 mm supplies (reels and splicing tape) are very hard to find — if not impossible — and we’re forced to creatively improvise in order to get the film onto reels that fit onto our scanners. All transfers to MOV, MP4 or DNX require a flash drive or portable hard drive. Transfers to DVD will require a flash drive or portable hard drive unless you specifically decline the master image sequence (which we do not recommend!). You may include your own drive with your order or purchase from us – enquire Help with drive size. Your order will be delayed if you decide to send your own drive after we are ready to start work. When doing a frame by frame film conversion there is no sound head to capture the sound from the film as the film is scanned. In order to add sound we must run the film a second time through another machine to capture the sound from the film. After this is done it must be married in sync to the film scan. It is a labor intensive process. While the master image sequence copy that we create is quite faithful to the original footage, you can opt for us to work through your film scene by scene, correcting for color, contrast and brightness. If you know your film has poor color and/or exposure, this is a good choice. This service will be done in conjunction with creating a viewing or editing copy of your film. All corrections made will appear on these copies. Color corrections do not appear on the “master image sequence copy” of your film. To maintain the integrity of the “archive” copy, it is left as untouched as possible. Degraining will take away a good deal of the natural grain of your film. Most people like the look — but this is largely subjective. We try to not over apply. All film being transferred is cleaned with a soft cloth and film cleaner. A “rewash” is essentially a good deal more thorough cleaning and rewetting of your film to take off more stubborn dirt and grime. Some Kodak films from the 1970s may have “snow flaking” which appears on the film something like snowflakes. This rewash treatment temporarily eliminates this issue, long enough to have the film scanned. Providing the emulsion is in good condition, a rewash can be very effective for removing grime from water- or flood-damaged film. 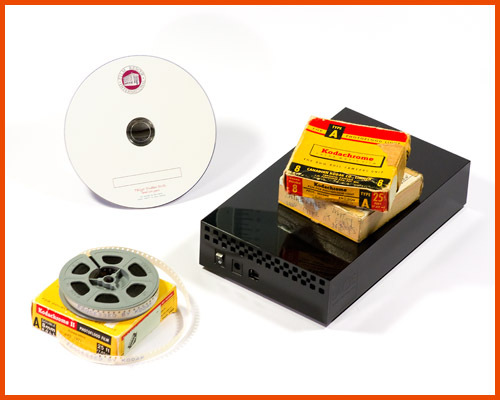 Preserve deteriorating and fragile videotape (including VHS, VHS-c, S-VHS, Hi-8, 8mm, MiniDv, DVcam, Betamax) by transferring to a current digital format. You can then use common software on your own computer to edit the files, make unlimited copies and share with your family. The more copies of your movies there are, the more likely they will be around into the future. The video tapes themselves are quickly deteriorating. 4 Minimum 2 hour charge. All times are rounded UP to nearest hour. 5 Billed by each source and/or by the hour, for example: Three tapes of 15 minutes each would be 3 x $12.50 or $37.50 . One tape of 1 hour 30 minutes would be 2 x $12.50 or $25.00. One tape of 2 hours would be 2 x $12.50 or $25.00. Due to the amount of time it takes to scan tapes and determine whether they are blank or contain copyright material, there is a handling charge of $10.00 per source when we determine a tape is blank or contains only copyright material (we do not transfer copyright material). Preserve fragile video tape (including VHS, VHS-c, S-VHS, Hi-8, Betamax) by transferring to more resilient DVD. If you are not happy with your transfer we will undertake steps to correct any problem. If that cannot be done to your satisfaction, we will pay (up to the amount we charged) to have your film transferred by a provider of your choice. Please check your transfer files in a timely manner to ensure everything is complete and playing properly on whatever system you are using. Due to the volume of work we do and the size of scan files, we cannot store files indefinitely. We allow a reasonable amount of time to be confident orders are received by customers. The drives we store backups on are cleared after 3 months. Orders should be completed in approximately 10 weeks. Please don’t wait until near the beginning of a cycle to send your film. This slows down our administrative work at the start of each cycle, delaying work for everyone.